Since opening 360Q we’ve met so many wonderful people from all across the Bellarine and beyond. But our customers don’t always get to chat with all our staff, so we thought we’d make it easy and introduce them to you instead! 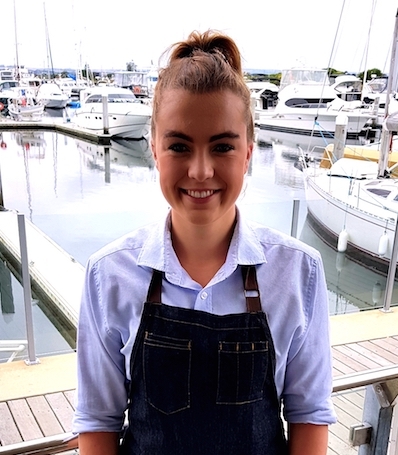 Here, it’s our pleasure to introduce Ellie Westmoreland, one of friendly and very talented front of house staff members. See her Q&A below! How long have you been working for Barry Iddles and the 360Q crew? I think I’ve been working for Barry and the 360Q for more than two months or so now. I think at the beginning it’s always learning the menu and recognising the meals when the chefs put them up on the pass in the kitchen for service. First and foremost, customers always love to be served with a smile. I believe it’s important to always give the customers the attention they deserve and never leave them feeling ignored. Are you sick of the view over the Queenscliff Marina yet? Most definitely not. I don’t think I will ever get sick of the view. I love being there in the mornings before the customers come in because that’s when I really get to appreciate what the Marina has to offer. What is it about 360Q that you like the most? While the view is a definitely a bonus, the people are hands down the best thing about going to work every day. Both members of staff and the lovely customers. What is the strangest customer request you’ve had? I actually don’t think I’ve had a strange request yet (that I can remember anyway). But I’m sure there is one to come in the future. Funniest moment you’ve had at work? This is a hard one to answer. I honestly don’t think I could pick one, there is never a dull moment at work. Your favourite thing on the 360Q menu? Again this is a tough one to answer but I think the Barramundi is right at the top of my list. It always looks absolutely delicious and I can’t wait to try it one day. When I’m not at work, I love to focus on my university studies and my horse riding. I like to keep myself busy otherwise I just get bored! Check out our menu for more amazing options! 360Q is open seven days a week for breakfast and lunch and for dinner from Thursday to Sunday. Click here to book your table online using our new reservations system or call 5257 4200 or email enquiries@360q.com.au to book.